More details are beginning to emerge on the Egyptian inscription withdrawn from the sale of antiquities at Bonhams on May 1, 2008 ("Egypt secures auction pullout for artefacts in London and Holland", Egypt Daily News, May 1, 2008). 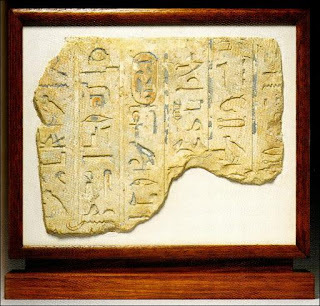 The text has removed from "a wall in the 26th Dynasty tomb of Mutirdis in Asasif in Luxor". This tomb (TT410) was excavated by Jan Assmann in 1969 so it looks as if the story about the Australian seafarer collecting the piece perhaps as far back as the 1940s lacks substance. A photograph of the text appears in “Das Grab der Mutirdis” (1977). Bonhams need to make a statement about this. Who translated the text for them? Did the person recognise the text but keep quiet? Were the staff members of the Department of Antiquities at Bonhams unable to conduct a thorough due diligence search? Why were they unable to link the personal names that appear here with the tomb of Mutirdis? And what other antiquities consigned to Bonhams came from the "Australian seafaring collection"?